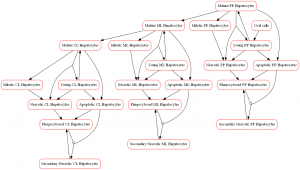 What is the Hepatocyte Life Cycle Submodel? 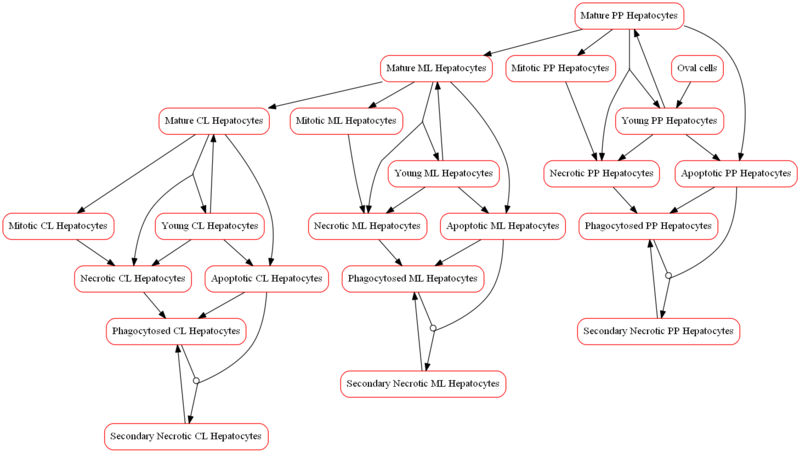 This submodel captures the life cycle of the hepatocytes. Explicit tracking of individual hepatocyte pools (necrotic, apoptotic, and mitotic) is done with DILIsym, as it enables comparisons with histological data. Mature and young hepatocytes are also discretely included, as they may have different rates of necrosis and apoptosis, and non-viable cells are cleared with specified half-lives. With appropriate internal and external cues, mature hepatocytes can commit to mitosis and divide into young hepatocytes. Cell division can be slowed by crowding signals, resulting in cell cycle arrest. Oval cells contribute to hepatocyte populations in the periportal zone and hepatocytes may ‘stream’ (i.e., migrate over time) from periportal to midlobular and then to centrilobular zones. The contributing rates of hepatocellular proliferation are regulated by mediators, such as serum TNF and HGF; hepatocellular necrosis is controlled by the bioenergetic state of the liver while apoptosis is largely regulated by oxidative stress combined with the bioenergetic state. The release of biomarkers in DILIsym is driven by the rates of hepatocyte necrosis and apoptosis.